* "Frazee’s controlled palette of subdued golds, browns, and grays offers a fitting backdrop for the hard-working farmer foregrounded in this wordless tale. . . . A swiftly moving circus train on the horizon introduces color and an unexpected visitor, when a bump on the tracks ejects a young clown. Exuberance meets quiet responsibility as the whirlwind in a red one-piece, the small clown, embraces the legs of the old man. . . . This is a tender look at light and shadow, the joy and comfort in companionship, the lift that laughter provides, and the friendship possible among generations (and species). The poignant relationship calls to mind the quiet potency of scenes in Raymond Briggs’s The Snowman (Random, 1978) and Sarah Stewart’s The Gardener (Farrar, 2007). Lovely." A solitary farmer on an empty plain receives the most unlikely visitor. A tall, scowling farmer labors with a pitchfork on an endless brown field. In the distance, surprisingly, a steam train crosses the horizon. As the train chugs off the edge of the spread, a jolt propels something off the caboose. The startled farmer sets out in that direction. He finds a small clown, wearing white makeup, a red-and-yellow costume and a broad smile. The clown deftly pantomimes having fallen off the train—action and emotion shine wordlessly—and the farmer takes him home. Silently they stare at each other, eat and wash their faces. Without makeup, the child-clown's smile disappears; is he sad to lose that connection to his home-train, or had the smile been made of makeup all along? With growing tenderness, the farmer watches over his sleeping guest and, come morning, hops and dances to cheer him up. They juggle eggs and share real farmwork until the circus train returns along the distant tracks. Its shape and primary colors make it look like a toy, especially against the soft, textured grays and browns of the farm, skies and earth. Using gouache and black pencil, Frazee—a virtuoso of mood and line—takes the surly farmer through bafflement, contemplativeness and true affection.The beauty of an unexpected visit, done beautifully. "Frazee (Boot & Shoe) crafts an affecting wordless narrative about a solitary man and his unexpected visitor...Frazee expertly paces the story in sequential panels, implying the grandfatherly man's growing tenderness for the lost child. The circus train's return feels bittersweet until readers observe that the farmer will not be alone for long. A gorgeously executed account of the power of companionship and compassion. " In this wordless picture book, a bearded farmer is alarmed to see a young clown tumble out of a passing circus train...Frazee uses a muted color palette that matches the quiet, gentle mood of the story. Her simply drawn characters with minimal facial features beautifully convey emotions, particularly when the dour farmer has more pep in his step after he and the clown go separate ways (but trade hats first). Little ones will delight in the farmer clowning around to the last page, which promises a fun surprise for the old man. Joyful, tender and triumphant, without a word spoken, this is storytelling at its finest. 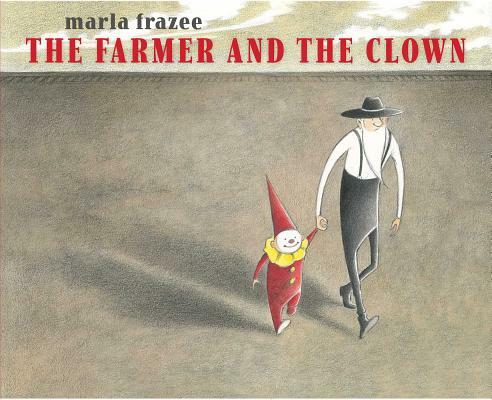 Marla Frazee’s “The Farmer and the Clown” (Beach Lane, 32 pages, $17.99) has an immediately hopeful feel: On the cover, a sober old fellow in Amish garb trots through a featureless landscape holding the hand of a smiling little clown. What brings such unlikely companions together? As we learn in a series of clean, airy illustrations, the clown—a child of no more than 4—has fallen off a circus train, and the farmer is taking him home to his solitary dwelling. At first the farmer seems at a loss, then it is the child’s turn to feel worried, but finally, to our relief, the two begin to console each other, and the next day—hoorah!—the circus train returns. Of course we rejoice when the little clown rejoins his family, but we feel a pang for the farmer, who is alone again. Or is he? In a final image, we see him glumly headed home, unaware that a new impish companion is following. Shelf Talker: A Caldecott Honor artist takes readers on a wordless emotional journey that begins with a life-altering meeting between a farmer and a clown child thrown from a circus train. ...Frazee imbues her simple story with the immediacy and pathos of a short silent film, and both the clown kid and the old farmer are dramatic body actors: the kid’s overemoting and excitedly flapping limbs make him the fizzy center of most spreads, and his disconsolate drooping is as sad as a puppy whimper. The pencil and gouache landscapes draw on soft, smoky grays and yellows and sometimes grayish yellows, giving the wide-open plains a period, possibly Depression-era feel that adds atmosphere and enhances the importance of the warmth between the two protagonists. Audiences, especially those cuddled in willing adult laps, will enjoy filling in the gaps of this story brimming with both pathos and comfort—and those viewers worried about the newly bereft farmer will appreciate the last page, where a circus monkey stealthily follows the man back home to start a new story. Appearances can be deceiving in this superb wordless book from two-time Caldecott Honor recipient Frazee...Using only pictures, Frazee’s book—both spare and astonishingly rich—offers a riveting narrative, characters to care deeply about, and an impressive range of emotion.